EVERY once in a while a book comes along that sends the critics lurching for the box marked 'five stars'. The cynics among us, generally, in turn lurch for the box marked 'hype', closely followed by a glance at the spine to see which of the big publishers are to blame this time. When, however, the press is too small to register even on the most sensitive of radar, it poses a whole new question: are the critics for real? 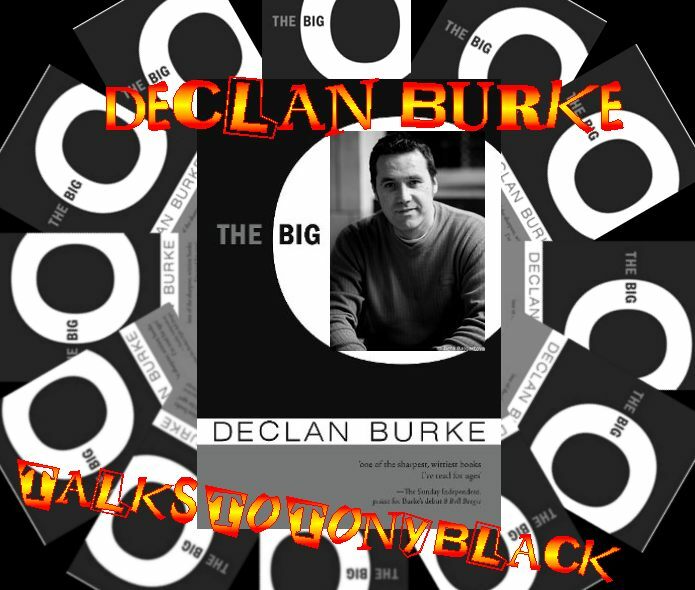 In the case of Declan Burke's The Big O, published by Hag's Head Press – no, I hadn't heard of them either – it's safe to assume we are indeed getting the real deal here. Comparisons to Elmore Leonard and fulsome praise from the likes of The Irish Times and the Irish Independent have attached themselves to the young Irish author since The Big O's release. All the praise is thoroughly deserved too. With his second novel – following Eightball Boogie – Burke exhibits a Svengali-like control over his characters to produce a story that's as slick as they come. A pacey plot, street smarts . . . it's all there. And, all told with the kind of style you'd expect to pay Harvey Nicks prices for. Don't try to convince the author of this though, as I found during our Q&A for Shots, Declan Burke is far too modest to accept his very well deserved plaudits. TONY BLACK: What got you writing The Big O, I heard, was catching your wife flushing a chick-lit novel down the khazi ... is it true? TB: So, tell me, did a chick with a penchant for armed robbery do the trick for Aileen? TB: Did you consult her at any part of the writing process? TB: The Big O has some incredible characters, where did they all come from? DB: Tough question - where do any characters come from? I guess they’re all multi-creations, y’know, a little bit people I know or have known, a little bit of some news story I spotted on TV, a little bit a favourite character from a movie … at least, that’s how they started out. Then they kind of organised themselves into who they really were, and started dictating where they were going, what they were saying, that kind of thing. That sounds a bit wanky, I know, but it’s tough to try and make a character say something he or she is unlikely to say. You know it yourself that it sounds wrong, the reader will definitely pick up on it, and most importantly, the character will go on strike until you stop trying to turn them into something they’re not. TB: A lot of writers shy away from the multi-character viewpoint though, was this something you expressly wanted to explore? DB: Big time. I’d spent quite a bit of time writing first-person narratives, which I hugely enjoy, both to read and write … but by the time I got to writing The Big O, I’d spent three years working on a Harry Rigby trilogy, of which Eightball is the first part, and I was feeling a bit claustrophobic … So I definitely wanted to broaden things out, try my hand at trying to make a variety of characters’ voices real … I’m a big fan of Elmore Leonard (who isn’t? ), and I love the way his multiple-character stories come together. To a certain extent, I was trying to write The Big O in that style – Barry Gifford’s ‘on the road’ novels were a big influence on it too. And I loved, from my own point of view, the liberation of sitting down every day and writing another piece of the jigsaw from a different character’s POV … it really is a great way to stay fresh. TB: The book's had some huge raves in the press ... what's the most flattering comment you've received? DB: Yep, people have been generous above and beyond the call of duty, which is something I’m still not used to … and I hope I never do get used to it. It’s been brilliant that a few reviewers have mentioned the book in the same breath as Elmore Leonard, although no one knows better than me how far wide of the mark those comments are, unfortunately … I think it has a lot to do with the fact that I use an Elmore Leonard quote to open the story, to be honest. But the most flattering thing for me is that the word ‘fun’ has popped up so often in the reviews. The Big O was the most fun I’ve ever had as a writer, it really was a joy – with most other books I’ve written, there’s an element of grind to it that’s not enjoyable, even though it’s essential – I’m not a ‘natural’ writer by any means. But The Big O was a blast from start to finish, and I’m delighted that that’s coming off the page for people, that they’re finding it fun too. TB: The Elmore Leonard remark has been widely repeated, and I actually found it quite apt, with the style, the plot and the large amounts of dialogue ... but, you really don't agree with the comparison? DB: Short answer – no. I’m so far below the standard set by Elmore Leonard that I get cold sweats, nosebleeds and vertigo at the thought of looking up to see how far I’d have to go just to get into the same ball-park … I think he’s one of the most gifted storytellers of this or any generation. The Big O is well-intended and genuinely meant, but it’s a very clumsy homage to the kind of stories he tells. TB: Another great, The Guv’nor himself, Ken Bruen waxes lyrical about The Big O, his success must be an inspiration to new Irish crime writers, has he been an influence? DB: Ken Bruen … man, what that guy won’t do to help another writer. He’s a full-time gentleman, part-time writer, if you know what I mean … as for an influence, absolutely. We’ve always had really good crime writers in Ireland, at least we’ve had them for the last 20 years or so … Vincent Banville, Jim Lusby, Eugene McEldowney, KT McCaffrey, Colin Bateman … but Ken was the first to set his stories here and break out in a big way. John Connolly is huge in the States, of course, but he sets his stories in the States … Ireland has changed a lot in the last 10 or 15 years, and Ken’s blazed a trail, when he started setting his Jack Taylor series in Galway, for setting stories on Irish mean streets in a way that translated for an international audience … Mind you, if any publisher out there wants to pick up a copy of any of Vincent Banville’s novels, they’ll find a ready-made series that’ll wow any modern audience … But Ken, in terms of being an inspiration, is the Irish crime equivalent that U2 was to a whole generation of Irish musicians. No doubt. TB: What other writers will we find on Dec Burke's bookshelves? DB: Crikey … how long do we have? I have pretty catholic tastes … I read a lot of crime fiction but I don’t discriminate against good books, no matter the genre … some of the best books I’ve read in the last few months are Adrian McKinty’s Dead trilogy, Dan Kavanagh’s Putting the Boot In, Mary Renault’s The Mask of Apollo, John Connolly’s Book of Lost Things, Derek Landy’s Skulduggery Pleasant, Half Moon Investigations by Eoin Colfer, Gerard Donovan’s Julius Winsome, Brian McGilloway’s Borderlands, Songs on Bronze: Greek Myths Retold by Nigel Spivey, Flannery O’Connor’s Wise Blood, Karen Armstrong’s A History of God, Birdsong by Sebastian Faulks … sorry, it’s a list that just goes on. TB: Bizarrely, I believe you struggled to find a publisher for The Big O... what the hell's wrong with them? DB: I don’t think there’s anything wrong with individual publishers per se, I think the issue is the way the industry is going in general. The rejection letters I got were pretty complimentary, but the general gist was that The Big O wasn’t ‘commercial enough’ … which was frustrating, but you have to accept that the big publishers (and we only sent it to the big UK publishers) have economies of scale – these days, unless you’re talking about potentially shifting tens of thousands of units, you’re not going to get into the game. But, naïve as this sounds, I’m in this for the sheer joy of writing. I’m not in it to become a millionaire, or – far more importantly – make someone else a millionaire. If the books I write aren’t going to top the best-seller list, so be it … and to be perfectly honest, I haven’t read a book off the best-seller list in I don’t know how many years … no, I lie - but Birdsong this year and Captain Corelli’s Mandolin a few years back, that’s about the height of it (and Book of Lost Things – that made the best-sellers, right?). But I really do think we’re seeing a seismic shift happening in terms of book publishing, that we’re in the early years of it already … I think, in years to come, you’ll have a tiny amount of writers – or a writing brand, like ‘James Patterson’ – selling tons of books, while most of the pyramid will be made up of hundreds of thousands of writers scuffling around selling hundreds of copies of any particular title via indie labels … and to be perfectly honest, I don’t necessarily think that that’s such a bad thing. Like the punk revolution, people will have to learn to stop depending on the big publishers and learn how to circumvent the system and DIY their books out there by any means necessary … It’s rock ‘n’ roll, man! TB: How did the Hag's Head Press deal come about? DB: I read a novel by Marsha Swan, the driving force behind Hag’s Head, called Dirty Sky, which I loved … a brash Ray Carver is how it read to me. Anyway, we got in touch as a result, and I discovered that she’d worked as editor on my first book, Eightball Boogie, for Lilliput … So she said she’d like to read anything else I had going on, and by then I’d decided to either shelve The Big O, because I’d learned all I’d needed to learn about the Irish publishing industry with Eightball, most of it bad news, or go ahead and self-publish, just for the hell of it, to see what I could see … To cut a long story short, Marsha offered to publish the book through Hag’s Head, with a 50-50 costs-and-profits deal, which meant I’d get to enjoy the self-publishing hustle but also get to piggyback Marsha’s experience … plus, she’s a brilliant editor. From her point of view, I guess she just liked the story and thought it fit in well with the Hag’s Head canon. TB: It was a brave move, one I imagine, fraught with difficulties ... what's been the hardest part of getting The Big O out there? DB: Fraught with difficulties … yep, you could say that! Marsha was taking a leap of faith, and I was in a position where I’d recently lost my job, so it was a bit of a leap of faith on my side too, to invest money in a project that the UK publishers said wasn’t ‘commercial enough’. And there was a moment of truth when Aileen and I talked it through, and asked ourselves whether we had the courage of our convictions at a time when, y’know, the mortgage interest rates were starting to climb and we were planning on starting a family. But nothing good comes easy, right? And while it was a substantial sum of money to us at the time, the co-publishing route is relatively cheap, depending on your expectations. From a purely physical point of view, the actual distribution was the hardest part … I was walking into bookstores with the book in my sweaty hand, butterflies in my stomach, thinking, ‘JK Rowling never had to do this …’ And you know what? No matter what happens in the years to come, I’ll always remember the intense physicality of doing that, of what it means to hustle in the true sense … I know most people in the industry look down their noses at self- and co-published books, but I’m indecently proud of the fact that I got off my arse and hustled The Big O out there. Worst case scenario – and we’ve already broken even, selling through the Hag’s Head website – I’ll have a pretty good story for the grandkids …! TB: Is it a route you'd recommend? Or, follow again yourself? DB: Absolutely, I think it’s something every writer should do, to acquaint themselves with the industry from the ground-floor up, right from putting the first words on the page to delivering the book to the shelf. Will I do it again? Absolutely. It’s a lot of hard work but you get out what you put in … I’ve learned more in the last six months than I did in the previous 20 years. The sense of self-gratification, when the reviews started coming in, was immense. Not that they proved anyone wrong, or anything like that … but it was a justification for Aileen, Marsha and I for taking that leap of faith. TB: Your previous novel, Eightball Boogie was every bit as well received by the critics as The Big O, did you learn anything from that book's publication that you could use this time round? TB: How healthy is the Irish crime writing scene right now in your opinion? TB: You're now dabbling in the murky waters of the internet with your website, Crime Always Pays, what prompted this? DB: A combination of factors, really. With Hag’s Head being a tiny publisher, and the promotion budget non-existent, I thought I should probably try to promote the book on-line … I’ve been writing for the internet – movie reviews, mainly – on and off for the last 10 years or so, and I love the medium. I was also the editor of a sports website for a few months last year, until I realised the bills were never going to get paid that way … But the bug bit, and I love blogging. In tandem with all of that, I realised there was a niche out there – the huge amount of Irish crime fiction writers that I’ve already mentioned – that wasn’t being covered, so I thought I’d give it some oxygen and promote myself alongside it … That was before I stumbled across Critical Mick, of course, who has been ploughing a lone furrow promoting Irish crime fiction for some years now … and he’s been a brilliant help in getting Crime Always Pays up and running. TB: Crime Always Pays updates daily, the workload must be immense, does it cut in to your writing schedule? DB: Definitely. You can’t do everything, and I work freelance as a writer, doing movie and theatre reviews, so I made a conscious decision to sacrifice my writing for the time being, in order to do justice to the decision Marsha, Aileen and I took. So I decided to not write any fiction at all for at least six months … some hope, it’s a sickness. But I hugely enjoy blogging with Crime Always Pays, and it’s brought me into contact with so many writers and other bloggers, people from all over the publishing industry … and the best thing of all is, the community – especially the crime fiction community – is so generous with its time and advice and help that the whole process is just so bloody easy it’s ridiculous. TB: Do you feel there's too much pressure on writers to market themselves these days? TB: Is there's more of an appetite for new writers among the online community? DB: Absolutely. I think the crime fiction audience, more so than any other, is always looking out for ‘the next big thing’. And it doesn’t even have to be ‘big’. It’s like when you were a kid and into the cool bands no one else had ever heard of … as soon as someone else thought they were cool, it was over. Next! … I think it helps hugely that the crime fiction church is so broad, that you can accommodate almost any kind of story and any storyline within the parameters of crime fiction. And the readers are hugely flexible for the most part, there’s no fussiness or snobbery. Plus, I’ve found that crime readers tend to read a lot more than other kinds of readers. And when you’re reading 20 / 40 / 60 books per year, rather than picking five or ten off the best-seller list, you’re far more open to different kinds of reading experiences. TB: And finally, what can we expect next from Declan Burke? DB: Well, I’ve been wanting to set a story in the Greek islands for some time, and I’ve started a story that I’m really loving at the moment … it’s kind of a Gil Brewer / David Goodis sexual obsession thing, set in the Cyclades. But as for when or if it’ll ever see the light of day, I haven’t the faintest idea. Mind you, that’s half the challenge … like I said before, the joy comes from actually writing the story. Getting it published, well, right now I can’t even allow myself to worry about that. If it does, great; if it doesn’t, the world isn’t going to miss one more or less book. TB: Dec, thanks for dropping by.